Super Series: No, mowing the lawn this weekend! Calling on all motorsport fans! This coming weekend (2013/02/23) will see the start of the Super Series (previously Wesbank Super Series) at the illustrious Kyalami Race Circuit—definitely one race series not to be missed. Friday slackers are more than welcome to visit the Kyalami race track and pit complex (FREE of charge of course), for a thunderous glimpse of what can be expected on official race Saturday. Do remember to bring your camera gear. The following exciting classes will make their race track appearance: Bridgestone SA Production Cars, SA Sports & GT Championship (V8 Supercars and Shelby Can-Ams), Unlimited Superbikes, 600 Supersport (both motorcycle classes will now run to international Super Stock Regulations), Engen Volkswagen Cup, Formula Volkswagen and Midas Formula 1600 (SA Single Seaters). The Bridgestone SA Production Cars class will be featuring: Subaru, BMW, Audi and Nissan in class A; while Volkswagen, Ford, Mazda, Mini and Opel will compete in class T. This prolific race class never fails to impress, with action from start to finish, in both heats. Trivial information for the masses: Kyalami Race Circuit is 4.26km in length, with 13 turns, reasonably wide and fast, giving the production cars (and the other race classes) enough “legroom” for ultimate performance. SA Sports & GT Championship are all about the ultra-quick Shelby Can-Ams, powered by a 260kW, 3.5 litre, V6 Nissan engine* and the thunderous V8 Supercars (Jaguar, Ford Falcon, Mustang, Chev- Corvette and Lumina), which can easily produce 373kW* with their 6 litre V8 engines, on a favourable race track like Kyalami. Please, do remember to bring a spare set of ears, or pack the ear-protection—these boys are extremely LOUD! The Unlimited Superbike class will feature great names like, Nicolas Grobler (the original Unlimited Superbike Joker), Nicholas Kershaw and Stephen Steenkamp, turning up the heat on their latest Kawasaki ZX10R race-bikes. Chris Leeson and Ryan Ottens will both retaliate on BMW S1000RR (HP4) race bikes, with impressive specs: 144 kW @ 13,000 rpm (claimed). They might just cause the Green Mamba (Joker’s bike) to lose some of its green skin. This race is a must see. Stiff competition can definitely be expected form Robert Portman and Dylan White, straddling Yamaha R1 motorcycles. Now this should also be worth following throughout the motorsport season. On the 600 Superport motorcycle front, action-boy Anthony "Fire Antz" Shelley will be dishing out seriously painful stings on his vibrant #74 yellow Kawasaki ZX6R. Nemeses, Dean Vos and fellow Yamaha R6 scoot jockey, Janine Mitchell, will not be taking this hands down. Their prominent appearance on the starting grid will be noted. This might be a big surprise to many, but Brent Harran and Cameron Petersen will both be contributing to the race action on MV Augusta F3 motorcycles. 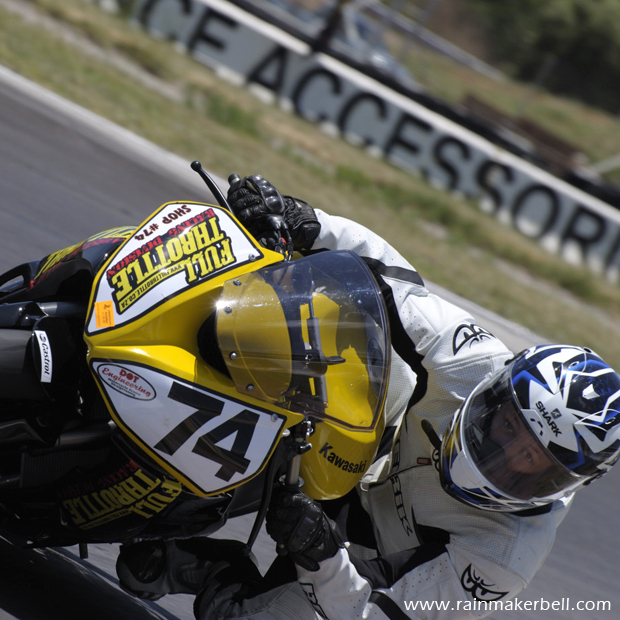 Words & Photo: Adriaan & Martine Venter (Super Series, Kyalami Raceway, South African Motorsport, 2013/02/19, Prequel 2 Sequel) Main Image: Anthony "Fire Antz" Shelley, Kawasaki ZX6R. *Approximately.